Nick Fitzgerald's final year at Mississippi State comes with sky-high expectations under a new head coach calling the shots in Starkville. As he recovers from the gruesome injury that ended his 2017, the unique quarterback is driven to take the Bulldogs and his own production to new heights. STARKVILLE, Miss. 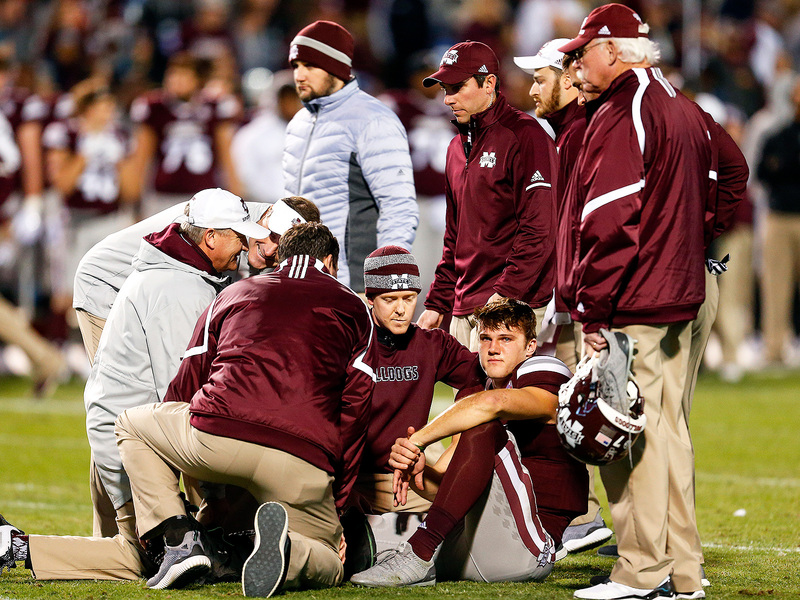 — A half-dozen black silver-dollar-sized discs are stuck to Nick Fitzgerald’s lower right leg and foot. These are hot pads, assistant athletic trainer Thomas Callans says, Fitzgerald looking on from a cushioned training table. Callans gestures to the small, dark patches, each connected by a wire to an unseen contraption. These stimulate the muscles, forcing them to pulsate—step one in Fitzgerald’s 45-minute rehabilitation session on this June day. For the past six months, this sprawling place has been Fitzgerald’s home. The Mississippi State sports medicine facility is tucked on the ground floor of the school’s five-year-old football building, and inside it are rows of training tables, pairs of whirlpools and dozens of healing tools. “Lots of space,” Callans says excitedly, glancing around. Mississippi State’s starting quarterback can joke now, and he joked then, too, when his right foot dangled off the end of his leg on Thanksgiving night. Rusty Linton remembers because he was there. He’s the one who, upon arriving to a writhing 21-year old, immediately slid Fitzgerald’s foot back onto his leg, essentially locating a dislocated ankle and inciting humor from his patient. “Pick me up and let me go back and play,” Fitzgerald told trainers. Have you seen the injury? New Bulldogs quarterbacks coach and passing game coordinator Andrew Breiner has. The former Fordham head coach saw it live, like millions of others watching on television, because ESPN cameras didn’t cut away soon enough after the hit, and for a cool nine seconds, Fitzgerald’s ankle pointed west and his leg pointed south. Breiner, queasy about such things, arrived at Mississippi State this winter planning to never watch it again. Fitzgerald had other ideas. “Yes, Nick, I’ve seen it,” Breiner told his quarterback. A lot has happened since that night, when 348 seconds into his team’s duel with Ole Miss, one Rebel (linebacker DeMarquis Gates) went low, another (end Breeland Speaks) went high and Fitzgerald’s right foot stayed planted in the Scott Field turf, crushed beneath his 230 pounds. Evidence of the ghastly injury is available in dozens of places on YouTube. The three most popular videos have a combined 300,000 views. Fitzgerald’s injury was an omen of change in Starkville. Mississippi State lost the Egg Bowl to an Ole Miss team with nothing but bragging rights to play for, and three days later, Dan Mullen, the man who found, recruited and tutored this overlooked prep quarterback from Georgia, accepted the Florida job, ending a nine-season run at Mississippi State. Joe Moorhead’s Goal Isn’t Just to Win at Mississippi State. It’s to Win Championships. Following a superstar is no easy task, but Fitzgerald has in many ways bested his predecessor Dak Prescott, with 14 school and conference records to show for his efforts. That’s the reason for the metaphorical weight on his 6'5" frame nine weeks before the start of his senior season. It’s his last chance to lead the Bulldogs to the SEC championship game, in his home state, one of two Fitzgerald goals entering 2018. The other: Break Tim Tebow’s SEC record for career rushing yards by a quarterback. He’s 462 yards shy. “That would be pretty cool,” he says. The buzz around Mississippi State goes beyond the quarterback. Fitzgerald is joined by 16 other returning starters from a team that won nine games, and the new staff even admits they partially took this gig because of a stacked roster that was ready to win immediately in the toughest division in college football. Soon, the staff will meet for what Breiner says is an annual summertime tradition under Moorhead, dating back to the duo’s days together at Fordham: They will rank, one through five, their best offensive personnel, the players who must touch the ball the most often. Back in that training facility, a floor beneath Breiner’s office, Fitzgerald has hopped off the training table and onto something that looks like someone sliced a foam football length wise, from tip to tip, painted it blue and plopped it flat side down. As Callans retreats, the quarterback steps onto the soft bump for a balancing act as his second rehabilitation exercise, designed to strengthen the ligaments near where the ankle meets the foot. Fitzgerald is right on schedule in his recovery. In fact, Callans says Fitzgerald could have played if Mississippi State’s spring game on April 21 had been a real game. But he spent spring practice participating only in non-contact drills. Mullen’s departure hurt, but the quarterback has bonded with the new staff, attending family events at Breiner’s house and making plans to hit the golf links with his 33-year-old position coach. “We’ve hit it off,” Breiner says. As the youngest of three boys, with a father in the Air Force and a mother who hung the message “Football is life” on the wall of the family’s home, Nick is no stranger to injuries. He played a junior high football game with a fractured forearm stabilized by bubble wrap and tape. He broke his right leg as a high school sophomore attempting to dunk, gashed his forehead on a basketball goal while bouncing on a trampoline and sliced open one of his fingers, a wound that needed 12 stitches to mend. His injury in the Egg Bowl was different from the others, but nothing compared to the one his older brother Justin sustained a few years ago in the Army. On a skydiving expedition, Justin’s parachute failed to open, and he plummeted to the ground, landed atop another soldier and broke his back. Next to that, a dislocated ankle doesn’t seem so bad. “I got over it a long time ago,” Nick says. Fitzgerald’s foot twisted with such violence that he chipped off part of his ankle bone (the talus), ruptured two significant ligaments and cracked his fibula. For now, a tight rope holds together his two leg bones until the syndesmotic ligament can heal itself, and a metal plate, with eight screws, stabilizes the fractured fibula. Linton says dislocated ankles are seen in car wrecks more than in football games, and the injury is not prone to repeat like a dislocated shoulder, which can pop out of place continuously. Fitzgerald’s injury is most similar to the one suffered last October by Celtics guard Gordon Hayward. In fact, Hayward sent a motivational message to Fitzgerald the day after the quarterback’s surgery. Fitzgerald’s future world doesn’t necessarily revolve around football. He speaks about the NFL as a possibility, not a dream. He’s living out his only real childhood dream now, playing SEC football, but that’s not to say he won’t try pro ball. He’s just not as reliant on it as his cohorts. His finance degree already in hand, Nick says he wants to live in a big city as a financial adviser and take care of rich people’s money. He admits to having a fascination with money and numbers, which Breiner learned in one of his first meetings with Fitzgerald this spring. The two were watching film as part of the new staff’s offensive installation, and the screen before them flickered with clips of a Breiner-coached Fordham team against Lafayette in 2016. Breiner mentioned tailback Chase Edmonds’s statistics that day: 359 yards on 17 carries. Within two seconds, Nick turned to his coach with the per-carry average: 21.1 yards. Fordham, located in the Bronx, played an important role in this staff’s takeover in Starkville. Moorhead turned his alma mater into an FCS playoffs regular starting in 2013, his second season at the school. In 2016, he joined James Franklin’s staff at Penn State, where his big-play offense helped the Nittany Lions to consecutive 11-win seasons. Breiner was Moorhead’s offensive coordinator at Fordham, took over as head coach when Moorhead left for State College and was one of Moorhead’s first hires in Starkville. Coaches claim Fitzgerald is a perfect fit for this offense, standing up well to the three questions Moorhead asks of his quarterbacks: Can he beat you with his brains, beat you with his arms and beat you with his legs? • SI's Top 100 College Football Players: Where Does Nick Fitzgerald Land? Fitzgerald’s arm is what excites Moorhead most; he and Breiner plan to use it more than Mullen’s staff did, hoping to further develop that area. Breiner believes the two statistics most relevant to winning and losing games are turnover margin and explosive plays. When he wasn’t welcoming his quarterbacks to what he calls the “RPO world” this spring, Breiner was putting them through drills to improve their long passes. Moorhead’s offense challenges defensive backs, as Penn State’s numbers can attest. The Nittany Lions have completed 124 passes of 20 or more yards since the start of the 2016 season, top-10 nationally. Mississippi State had 68 over that same span. Coaches know Fitzgerald has the ability because they witnessed it during the spring: the deep comebacker, the out route from the opposite hash, the inside seam ball between a safety and linebacker. They’ll lean on his arm more than his legs. In fact, the morning of a reporter’s visit, Moorhead had met with his offensive staff to discuss just how much to run Fitzgerald. His pre-snap assignments are changing, too. He’ll have less to do, fewer checks at the line, but the secondary reads may become more complicated. “It’s as much about coverage identification than it is physically throwing the ball in the place it needs to be,” Moorhead says. Two surgeries and months of rehabilitation have Fitzgerald’s ankle oh-so close to 100%, despite its appearance. A jagged eight-inch scar runs down the outside of his right leg, from his calf to his foot, and a two-inch scar on the inside of his right foot marks where Linton inserted a screw, then removed it six weeks later. They are there forever, unnecessary reminders in a world with the Internet. Immediately after the injury, from an X-ray room at Davis Wade Stadium, Fitzgerald scrolled on his phone through videos of the play, followed by the gruesome result.